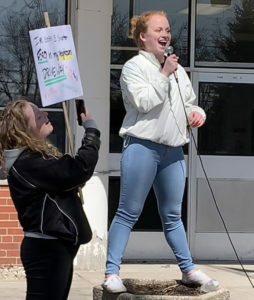 In throngs two-to-three deep, NDSS students lined the sidewalk nearly the full length of the school’s Belleville Road frontage Thursday to voice their opposition to education funding cuts contemplated by the provincial government. 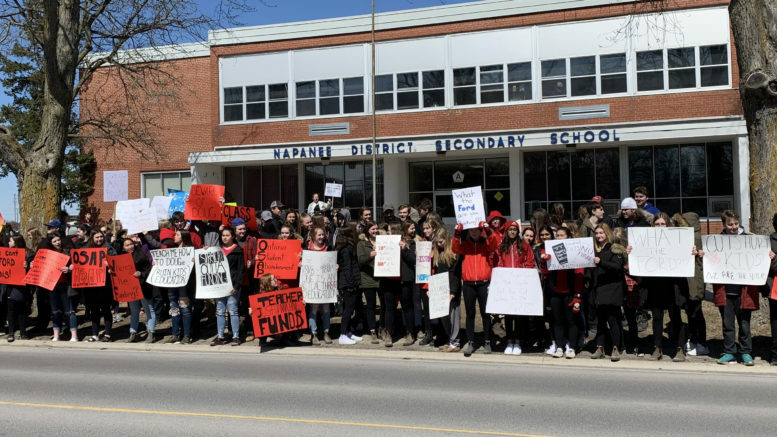 Some waved clever signage bearing slogans like “WTF: Where’s the Funding,” “We can’t af-Ford this,” or “Teachers just wanna have funds” and many offered chants like “Cuts hurt kids!” as the local students joined in with an estimated 100,000 peers in 800 schools across Ontario. Organizer Meghan Mosgrove thought about 200 students took part. Although she’s graduating, she has concerns about increasing class sizes, decreasing funding envelopes for teachers and student supports, and an anticipated loss in the range of programming available. Changes to funding programs that would support her post-secondary career are also a concern. While Mosgrove said she understands the province is in debt, she questions whether Premier Doug Ford really believes in the course of action his government is taking. She said she feels there’s already not enough funding for psychological services and educational assistants now, so losing even more of that support likely isn’t going to help anyone. Changes to the Ontario Student Assistance Program to offer some funding as loans instead of grants and to eliminate a grace period to start paying back loans also worry the senior student. Co-organizer Ariel Burgess also questions the path the government plans. “We’re not setting students up to succeed,” she said. She wondered if the government’s e-learning ideas would work, given the nature of Internet access in rural areas. Burgess also has seen the class-size creep already impacting her education. Mosgrove agreed, adding while not all of NDSS’s classes are overwhelmed because it is a rural school, it is still hard enough to find support now — and larger class sizes will just make that worse. Impacts on teaching and support staff also weigh on the students. Asked what her prescription would be for the education system and the province’s desire to improve its finances, Burgess said she would look at ineffective programs elsewhere, such as the Ontario News Network, and the Education Quality Assessment Office (EQAO) and its standardized testing regimen. Burgess said the student organizers at NDSS weren’t allowed to post any details at school about the walkout, so they used the social media platform Instagram and word of mouth to get their word out. She was impressed by her peers’ response. Burgess said while teachers weren’t officially allowed to support the walkout, they wore purple to show their support. She said students attended their classes and checked out to ensure their teachers knew where they were. Moving forward, she hopes to keep the activism alive, stating the next move would be to set up a meeting with MPP Daryl Kramp to discuss the students’ collective concerns. Future student actions might be discussed too. “We’re sending Ford a message: You can’t mess with our education system. I have a sister going into this mess. I don’t want her dealing with everything he’s proposing. It seems ridiculous to me,” Burgess said.